As the eldest son of President Joseph Marcelo Ejercito Estrada and Senator Luisa Pimentel-Ejercito Estrada, it is not surprising that like his parents, the Filipino masses have a special place in the heart of Senator Jinggoy Ejercito Estrada, along with siblings, Jacqueline Ejercito-Lopez and Jude Ejercito. In 1989, he was married to Ma. Presentacion "Precy" Vitug-Ejercito whom he was blessed with four wonderful and beautiful children, namely, Janella Marie, Joseph Luis Manuel, Julian Emilio and baby Julienne. Having witnessed how his famous and well-loved father, former Mayor of the historical town of San Juan has satisfactorily governed said locality over a progressive nineteen year period (1967-1986), Jinggoy knows that he is bound to follow the footsteps that his father has carved in both public service and show business arena. In his early 20s, Jinggoy became an actor and bagged the Filipino Academy for Movie Art and Science (FAMAS) Best Supporting Actor Award for his performance in the movie entitled "Farita Punzalan Story". In 1999, he also became the host of the television public service program, SaBAYAN, which has helped a number of Filipinos through significant exposés. Senator Jinggoy finished his primary and secondary education at the Ateneo de Manila University and earned a degree in A.B. Economics from the University of the Philippines. He took up Bachelor of Laws for four (4) years at the Lyceum University while serving as Vice-Mayor at the Municipality of San Juan at a young age of 25. In 1992, he became the youngest ever elected-local chief executive in the entire nation at age 29. For three (3) consecutive terms, he administered the economic, social, political, and cultural affairs of the Municipality of San Juan beyond everyone's expectations. He spearheaded various projects and programs for the improvement of the said municipality in the form of - construction of modernized Barangay Halls with Day Care Centers in all Barangays, repair and renovation of the now San Juan National High School, and other public elementary schools, recreation centers like gymnasiums, basketball courts and play grounds and the creation of different livelihood centers, improvement and replacement of drainages, concreting of municipal roads and the construction of a four-storey San Juan Medical Center and the San Juan Municipal Gymnasium. During his incumbency, San Juan gained the reputation of being one of the most progressive municipalities and the Most Peaceful Municipality in the Philippines. During his final tenure as Mayor, he was sworn into office as the National President of the League of Municipalities of the Philippines from 1998 to 2001, where he efficiently harnessed the potential of local government units as reliable partner of the national government in nation-building through his programs on continuous empowering of the LGUs by securing and producing better service facilities to at least 1,525 municipalities during his stint. In May 2004, the Filipino people gave the "Anak ng Masa" an official mandate to serve as Senator of the Republic of the Philippines (2004-2010). This gave him the chance to carry out his earnest desire to continue the pro-poor programs that his father has started and to pursue his commitment to address the problems besetting the country through just and meaningful legislations. 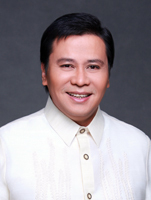 As the Chairman of the Senate Committee on Labor, Employment and Human Resources, Senator Jinggoy Ejercito Estrada is presently tasked with the study and deliberations on measures relating to labor; human resources development; maintenance of industrial peace; promotion of employer-employee cooperation; labor education, standards and statistics; organization of the labor market including recruitment, training and placement of workers and exports of human resources; foreign workers in the Philippines; promotion and development of workers' organization as well as employment-intensive technology. He also chairs the Congressional Oversight Committee on Labor and Employment (COCLE). His other committee assignments include: Accounts, Agriculture and Food, Blue Ribbon, Energy, Foreign Relations, Local Government, National Defense, Public Order and Illegal Drugs, Rules, Peace, Unification and Reconciliation, Urban Planning, Housing and Resettlement, Ways and Means. He is the Vice Chairman of the Committee on Games, Amusement and Sports and the Committee on Public Information and Mass Media. He also serves as a member of the Commission on Appointments. The good Senator introduced two hundred eighty-nine (289) bills and resolutions, two hundred forty-nine (249) of which were primarily authored by him. His current priority bills are geared towards improving and strengthening the policies affecting our workforce and overseas foreign workers, empowering our local government units, protecting and preserving our freedom of expression and assembly, and promotion of youth welfare. At present, he ranks fourth (4th) among the list of Senators with the most number of proposed legislations filed in the Upper House. Senator Jinggoy Ejercito Estrada has actively participated in the deliberations on various measures during committee hearings and plenary sessions. He has successfully sponsored and steered the passage on Third Reading of the National Labor Relations Commission Bill which rationalizes the composition and functions of said Commission in order to improve its administrative and operational efficiency, particularly on the issue concerning the speedy disposition of labor cases filed. He contributed to the refinement of certain measures particularly that of the UP Charter, Human Rights Victims Compensation Act, Amendments to the National Internal Revenue Code on E-Vat and the Excise Tax, National Budget, Synchronized Barangay and SK Elections, Ratification of the International Labour Organization Convention on Forced Labor and the Mandatory Hepatitis-B Immunization. Since his assumption to office, the Senator has delivered a total of seventeen (17) privilege speeches on varied issues such as the constitutionally guaranteed rights on freedom of speech, expression and right to public assembly, anomalous transactions and operations of Philippine Amusement and Gaming Corporation (PAGCOR), wiretapping scandal, and abuses of power by the current administration. Presently, Senator Jinggoy Ejercito Estrada is very much focused in keeping his commitment to the Filipino masa to do his very best as a legislator and as a public servant in securing a future far better than what we are all made to contend with, today.